Fatty acids are long-chain carboxylic acids. They are metabolically important because they can be used as high-energy fuel sources in the cell. Like gasoline, they contain long hydrocarbon chains, holding plenty of feedstocks for the formation of strong O-H and C=O bonds. Here is a list of common fatty acids. Fatty acids play a number of different roles, beyond serving as a fuel source. They can also be stored for the long term as triglycerides; we frequently see them modified in an ester form. These ester forms may be stored as fats, to be released when other energy stores are getting low, or they may be used to build cell membranes. For other purposes, they are modified into a thioester form. However, these modifications occur via carboxyloid substitutions that can be reversible. Hence, we can think of those other forms as pools of fatty acids because they can easily be converted into fatty acids if needed. Where do fatty acids come from? Apart from a couple of them that we need to take in from certain foods, we can make them ourselves, if we have to, in our cells. So, we are going to take a look at the essential synthetic transformations that build up a fatty acid molecule from smaller molecules available in the cell. 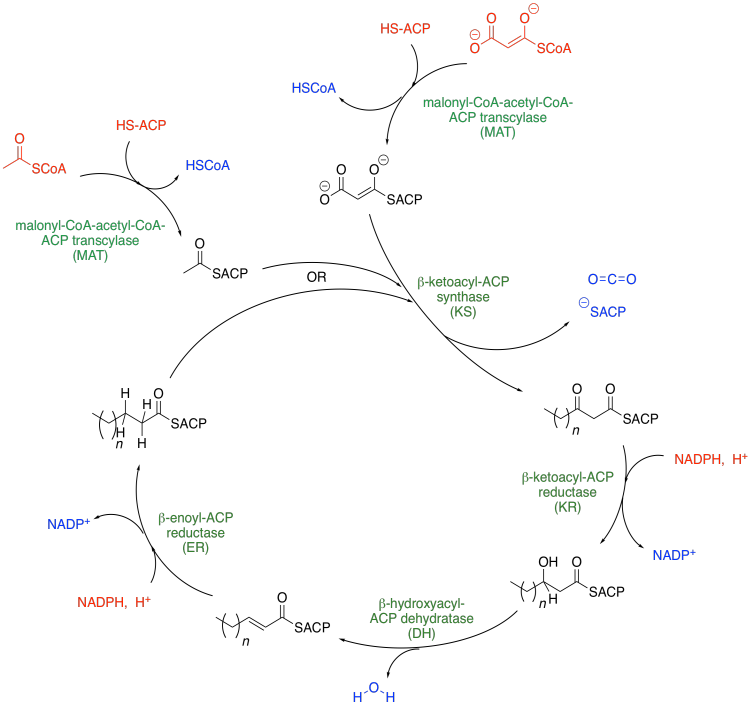 The pathway for fatty acid biosynthesis is shown below. Inputs into the system are shown in red, outputs are shown in blue, and the enzymatic domains are shown in green. Interestingly, plants and bacteria use a separate enzyme for each of these steps, whereas fungi and animals employ a megasynthase, a giant enzyme that can perform all of the steps in sequence, like one big fatty acid factory. The two units coming into the cycle are malonyl coenzyme A and acetyl coenzyme A. They join together to make a longer chain. The subscript n in the drawing is any even integer including zero. After the addition of the malonyl and acetyl thioesters at the top, we have a four carbon chain (n = 0). However, the product of the first cycle gets recycled and anothe rpair of carbons gets added, making a six-carbon chain, and so on. In the following pages we'll develop some of the ideas about how all of this works from the molecular point of view.